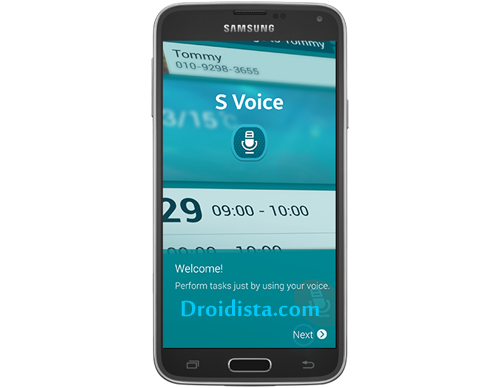 The new Samsung Galaxy S5 is equipped with a feature that allows you to command your phone to do specific jobs through spoken words; it's called S-Voice. If you like the idea of talking to your phone to do some tasks for you, you'll love this feature, although the current version of the app is far from perfection. This post will walk you through every S-Voice setting in your phone and how to use it with apps like to search the web, send a text message, and update your Facebook status. Language - it lets you choose what language to use. Hide offensive words - offensive words will be replaced by asterisks (*) when this feature is enabled. About - it gives you a quick intro to about S Voice. Open via the home key - when enabled, you can activate S Voice by tapping the Home key twice quickly. This is ideal for people who often use the feature but for those who don't, you better disable this setting as it affects the responsiveness of the Home screen because the phone would wait for the second tap to launch the app. Voice wake-up - this will allow you to wake your phone up by speaking the wake-up command you set. To use this, tap the ON/OFF switch beside Voice wake-up to turn the option on, and then tap Set wake-up command to record a command. Auto start speakerphone - since you can make a call with S Voice, this setting was included so that the speakerphone would automatically be turned on when the line is connected. Show body of message - you can enable this feature if you want to display the body of a message on the screen when it arrives. Check missed events - when you open the S Voice via a headset, you will be able to check events you missed. Personal briefing - when enabled, S Voice will act like a secretary and briefs you on your schedule. Home address - this will let you add or edit your home address. Log in to Facebook - this will basically let you log in to your Facebook account. In case you haven't installed the FB app on your phone yet, this setting will walk you through installing it. Log in to Twitter - you can log in to your Twitter account and also walk you through installing the app if you haven't done so. By default, S-Voice is enabled on your phone and the setting Open via the home key is active. This gives you two way to launch S-Voice; tapping the Apps icon and choose S Voice from the list of apps or double-tap the Home key. Once the app is up and running, you can start using it immediately. Making a phone call using S-Voice works like a breeze. This is one function that Samsung surely mastered, after all, the most basic function of the phone is to receive or make calls. To let S Voice do it for you hands-free, just say the word "call" plus the name of the person you're calling to that is in your contact list. For example, you want to call John. Say, "Call John" and S Voice will dial the number automatically and in a matter of seconds, you'll get John on the other line. If there's more than one John in your contact list, a pleasant female voice would ask you which "John" you want to call. Use the full name and S Voice will search through your contact list and once found, it dials the number. This process is a little longer compared to making a phone call but the interaction between you and S Voice will surely be flawless. All you have to do to send a text message is say "Send a text." S Voice will then ask you "Who would you like to message?" Say the name of the person you want to message and the app will look it up for you as long as it is in your contact list. Once found, the app will ask you "What's your message." Go ahead and dictate your message. Once done, S Voice will let you review it and if you're satisfied with it, just say "Send" and off it goes. Facebookers who own a Galaxy S5 and are fond of using S-Voice would surely enjoy updating their statuses hands-free. If you're one of them, all you need to do is connect S Voice to your Facebook account and allow the app to post on your behalf and you can speak to your phone what you want to appear on your wall. Launch the S Voice app and tap Menu. Now tap Log in to Facebook. If the Facebook app isn't installed yet, you will be prompted to install it first. Enter your Facebook credentials and tap Log In. With all these properly set, you can ask S Voice to post your status by saying "Post on Facebook." With S Voice app open and your phone connected to the internet, you can ask the app to search the web for just about anything. Say, you want to know who were the 2 U.S. Presidents during the World War 2, just ask S Voice about it and it will get back to you with more appropriate information. Basically, the app would make a search query using the keywords you've spoken. So, when trying to find information about something over the web using this app, you can ask it in a complete sentence or just keywords. I'm sure there are a lot of people enjoying this feature and I'm pretty sure the next version of S Voice would be a lot better than the one we have now. Samsung actually did a good job but there's still a lot of things that needed to be improved especially the capability of the app to recognize words. I hope this post somehow helped you. Please share. Thanks.